The HTC First is a mid-range touch screen smartphone that pushes Facebook integration to the front and centre — and includes NFC support. Facebook Home is a family of deeply integrated apps that replaces an Android phone’s regular start screen with a stream of posts, photos and notifications from the user’s friends, all delivered via the social network. That the social network could launch a phone of its own has been the subject of speculation for years, but Facebook has instead delivered an app which acts as a user experience layer on top of the Android operating system and will run on multiple devices. “There’s no other phone, app or operating system like it,” says Facebook, neatly pointing out that Home goes far wider than a single phone model and sits somewhere between an app and an operating system — with the potential to effectively replace both. 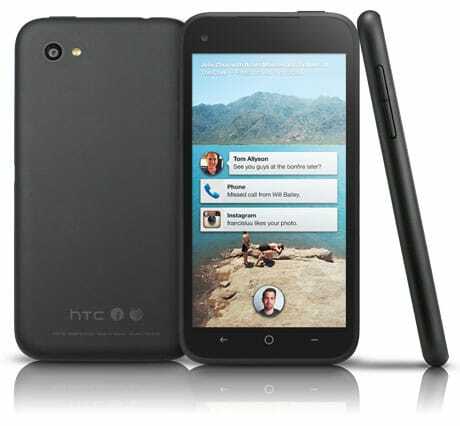 The HTC First features a 4.3-inch 1280 by 720 pixel touch screen, a 5MP camera and runs Android 4.1 Jelly Bean. A 1.4GHz dual core Qualcomm Snapdragon 400 SoC drives the device, which also offers Bluetooth 4.0 and LTE support. The First is available from AT&T in the US from 10 April at $99.99 on a two year contract, or $450 on a month-to-month deal. Facebook Home will be available to download from Google Play from Friday 12 April, and will initially run on the HTC First, HTC One, HTC One X, HTC One X+, Samsung Galaxy S III, Samsung Galaxy Note II and the forthcoming Samsung Galaxy S4.